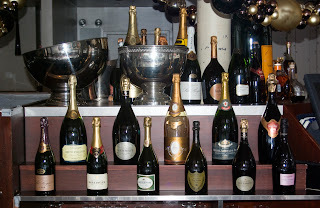 Most Champagne houses, no matter how large or small, produce several different examples of Champagne. From the basic non-vintage (or multi-vintage, if you will) to the ultra premium tete-de-cuvée, producers make a Champagne for various tastes at various price points. I'd like to tell you about a particular bottling from G.H. Mumm, one of the largest and most famous of all Champagne houses. While Mumm produces a typical house style non-vintage Brut as well as a premium cuvée called René Lalou, they also craft a lovely wine called Mumm de Cramant that is somewhat of an unknown gem. The wine is a Blanc de Blancs, meaning it is 100% Chardonnay; in this instance, all of the grapes are from vineyards owned by Mumm in the village of Cramant. This is a famous village in the Cote des Blancs section of the Champagne area; the vineyards Mumm uses are rated as Grand Cru, the highest-rated plantings in Champagne, so the quality of these grapes is exceptionally high. The wine is also known as a Cremant - "creaming" - meaning this wine has less pressure than a traditional Brut. Mumm refers to this style of Champagne as a "demi-mousse"; indeed the wine has only 4.5 bars of pressure as compared to 6 bars with most Brut, resulting in a softer, rounder finish. 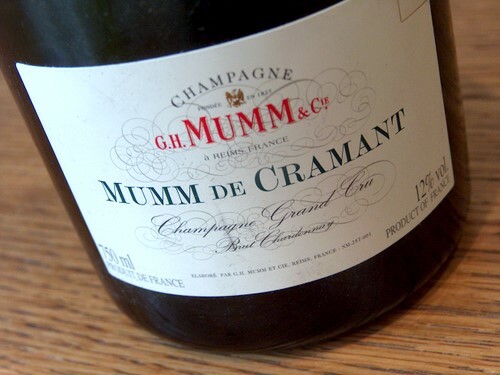 The wine was once known as Cremant de Cramant, but it is now known as Mumm de Cramant, certainly an easier name to remember and one that includes the producer's name. I've enjoyed this wine on previous occasions, but this was the first time in several years I had tasted this and I was very impressed. My notes focus on aromas of lemon peel, Bosc pear, graham cracker and yellow flowers. Medium-full, with impressive structure, the finish is quite long and features a distinct note of minerality. Above all, I love the complexity of this wine, as well as its delicious fruit and stylish nature. I've liked this wine before, but for me, this particular bottling was the finest I've tasted to date. I would pair this with a number of foods, from shellfish (shrimp or oysters would be ideal) to Asian cuisine to lighter poultry. The price for this limited Grand Cru Champagne is $75, which I think is quite fair. One other note - the top right hand corner of the label is folded. This symbolizes a French tradition of a special gift which would be delivered in person along with a card or envelope that had its top corner folded down. What a nice tradition, especially at the holidays and what a lovely wine from Mumm! I've thoroughly enjoyed the wines of Carmen, Chile's oldest wine producing company, since I was first introduced to them a little more than a decade ago. From the medium-priced riserva line of wines to the premium Gold Label offerings, this winery has always delivered the goods. I've recently tried the new releases from Carmen, which have seen a new label design for the Gran Riserva wines as well as a new national importer, Trinchero Wine Estates from California. There are six wines in the Gran Riserva line, which represent Carmen's dedication to the various terriors of Chile. Thus the Chardonnay is made from grapes sourced from Casablanca Valley, while the Sauvignon Blanc is from the cool Leyda Valley, only a few miles from the Pacific Ocean. 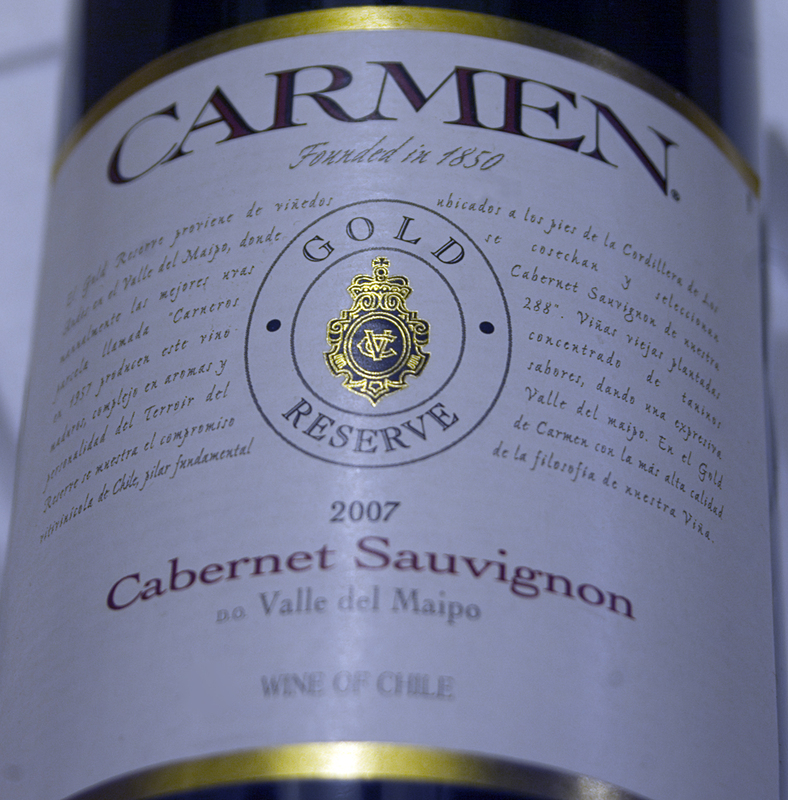 The Carmenere comes from estate vineyards in Colchagua Valley, a few hours south of Santiago, while the other reds (Cabernet Sauvignon, Merlot and Petite Sirah) are all sourced from Carmen's beautiful hillside estate in the Alto Maipo, about a 45-minute drive southeast of Santiago. My two favorite wines in the Gran Riserva lineup are the Cabernet Sauvignon and the Merlot, both from the 2009 vintage. Of course, the Alto Maipo is famous for Cabernet Sauvignon, as the wines here have good richness, lovely varietal character as well as soft tannins, which gives them an immediate drinkability. This Cabernet Sauvignon has good persistence and balance and along with the textbook varietal flavors of blackcurrant and red cherry, there are also notes of tobacco and dark chocolate. The Merlot is the real surprise, however. Merlot gets a lot of bad publicity these days for various reasons, but if more were made like this, you'd read a lot more positive notices for the grape variety. Black cherry and black plum fruit dominate this wine and the tannins are polished as you might expect. This is very drinkable now and will be a fine partner for most red meats - especially lamb - for the next 2-3 years. Both of these wines are $15 retail (all the Gran Riserva wines sell at the same price) and these two reds in particular are excellent values. Carmen has also released the 2007 vintage of their top red, the Gold Label Cabernet Sauvignon. I've been enjoying releases of this wine for the past six or seven vintages and have rated this wine as either excellent or outstanding every year. The wine is made from a beautifully sited vineyard that was planted in 1957; thus this 2007 release is from 50-year old fruit! Yields are low, the fruit is deeply concentrated on the palate and there is excellent persistence. As you might imagine, a wine this rich and young needs a bit of time in the bottle; I enjoyed this for dinner the other night at Al Dente restaurant in Chicago with a pork chop with poblano and red peppers, portobello mushroom and chipotle tomato coulis and as you might imagine, it was a heavenly pairing! The wine definitely needs at least 60-90 minutes of breathing time for enjoyment for dinner tonight; however the wine is just an infant and will improve for another 10-12 years, when it will be at its best. 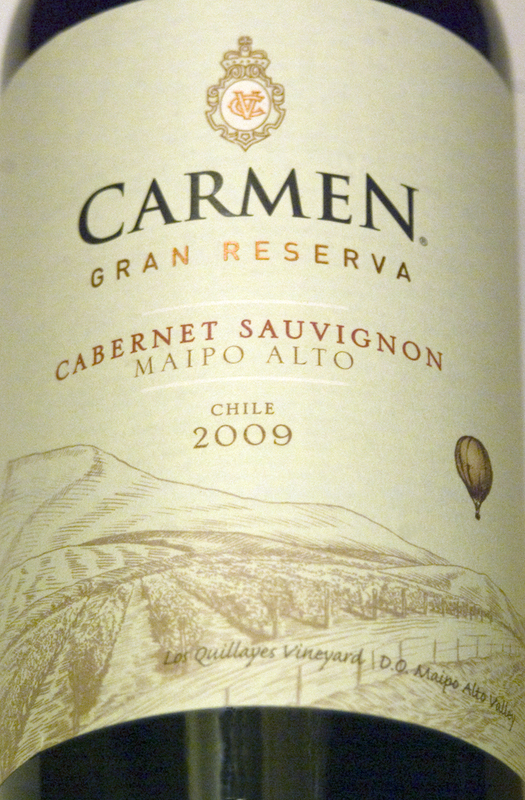 The price on this gorgeous Maipo Valley Cabernet Sauvignon from Carmen is $50. I can guarantee you that a Cabernet Sauvignon made from 50-year old vineyards in Napa Valley would cost you at least $75 and probably more like $100 or $125 a bottle. This is another excellent value. Here's to the consistency of Carmen wines, be it at $15 or $50 a bottle. This remains one of Chile's finest producers, I'm quite pleased to say! Throughout Europe, the wine producers that are discussed in great detail are the ones that have been producing their offerings for many years. While you do hear about new estates from time to time, it's the firms that have been around for decades or even centuries that are something of a reference point in Italy, France and other European countries. Yet in California - especially in Napa Valley, it's the newest of producers that receive most of the headlines, while the wineries that have been around for 30 or 40 years (admittedly, a long time in Napa Valley history), seem to be overlooked. 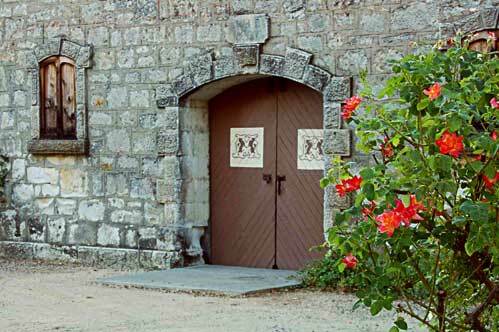 Think about it, you hear about the latest hotshots from Napa all the time, but when's the last time you read an article about a winery such as Joseph Phelps or Sterling? Did their wines suddenly decrease in quality? The answer is no, but these companies are not as fascinating or hip to many of today's wine writers, who are always looking for the newest viticultural temple funded by some multi-millionaire who hires the most expensive - and cult-driven - winemaker available. 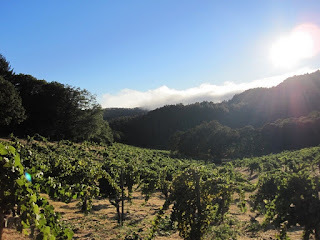 So, I'm quite pleased to sing the praises of a real Napa Valley veteran- Mayacamas Vineyards. 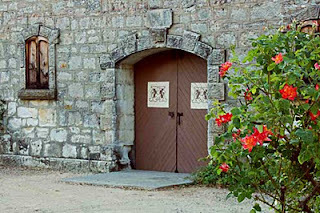 The winery was established way back in 1968 (talk about ancient history for this part of the viticultural world!) by Bob Travers, who today, is still making the wines. Named for the mountain range that serves as a border between Napa and Sonoma, the winery is situated some 2000 feet above the Napa Valley floor. This is a hidden gem, located in a place where coyotes, cougars and bobcats dwell. The vineyards, located at elevations ranging from 1800 to 2300 feet above sea level naturally yield very small crops, ensuring wines of structure for long-term aging. The other night I tried the current release of the winery's signature Cabernet Sauvignon from the 2006 vintage. Blended with 14% Merlot and 1% Cabernet Franc, this is a mouth-filling wine. But lest you think this is a typical blockbuster Napa Valley Cabernet Sauvignon, consider several things. First, the wine is aged for 18 months in large American oak casks and then 12 months in French 60-gallon oak barrels. This is quite different from the standard practice these days in Napa, where many producers use only French barriques (225-liter) for an aging period of 14-20 months. By using larger barrels for his wines, Travers focuses on the special fruit flavors he derives from his vineyards; my notes on the wine focus on perfumes of black currant, eucalyptus and blackberry. The wine has a beautifully developed mid-palate with layers of fruit while the finish is quite long with excellent persistence, good acidity and nicely integrated oak. The overall balance is ideal and the complexity is marvelous. My best guess is that the wine will improve dramatically over the next few years and be at its best in 12-15 years. The price is $65 a bottle and when you consider all the $100- $150 bottles of Napa Valley Cabernet Sauvignon out there (especially from the new hotshots), this is an excellent value (consider also that less than 1400 cases of this wine were produced). I'd even be tempted to call the $65 price tag for a wine of this breeding and class a real steal! Bob Travers, here's to you during this holiday season for continuing to produce classic Napa Valley Cabernet Sauvignon for more than 40 years and for maintaining a sane price point. It's a lesson some of the new kids on the block need to learn. Traveling to Italy is all about making discoveries. This includes new wines, new ristoranti and trattorie and of course, meeting producers I have never encountered. During my most recent trip to Valpolicella, I met Mariano Buglioni, the owner of the eponymous estate in San Pietro in Cariano, located in Valpolicella Classico; rarely have I met such a generous man. Buglioni, formerly in the textile industry, produced his first wines from the 2001 vintage. 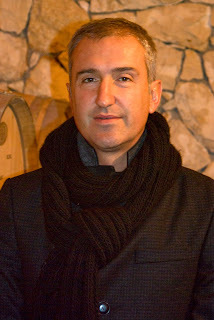 He currently crafts several types of wine, from the famous - Amarone and Valpolicella - to the unique - such as a sparkling Molinara and a 100% Garganega IGT. He has also made a name for himself with his eateries, especially with his osteria located on Corso Porta Borsoni in the heart of the old section of Verona. Mariano took me there early on a Sunday evening in November and we could barely move, finally finding a spot at the end of the bar. Mariano told me that I should see the place during the week, as I wouldn't be able to find a place at all. Given how little room was available that evening, I'd hate to see the place even more crowded! Mariano also took me to see another osteria of his, this one in the town of Santa Maria de Negrar. This one is larger and thankfully, less crowded, but just as engaging. There is a beautiful bar and display of all the foods, which are all marvelous. One of my favorites is the tartina con paté di olive nere con pancetta (a small paté made of black olives served with pancetta); there are several other lovely comfort foods as well. You can take a look at these at the website link here. Mariano wanted to show me these places, but first and foremost, he wanted to show off his wines with a special dinner, so we went to his locanda, located in the countryside of Valpolicella just a short walk from his agriturismo in Cariano. This is a warm dining room with rich earth tones with food specialy created for the Buglioni wines. I enjoyed five wines with various courses and each wine was extremely well made with excellent balance and ideal structure. The finest wines for me were the 2007 Valpolicella Ripasso "Il Bugardo" and the 2006 Amarone. The former offers ripe black plum and raspberry aromas with very good depth of fruit and peristence and will drink well for 5-7 years; I gave this wine an excellent rating. The Amarone, from the first-rate 2006 vintage has beautiful black cherry and myrtle aromas is is quite simply, mouthfilling! This is a powerful wine (17% alcohol), but nicely balanced with proper acidity along with excellent persistence. I would expect this outstanding wine to be at its best in 12-15 years. Incidentally, the Amarone was served with a veal medallion- a simple pairing that brought out the best in the wine and the food. All in all, I had a great evening in the company of my new friend Mariano Buglioni. We spent five hours together; this after he drove that morning from Bern, Switzerland, a seven-hour journey! How he found the energy to do this in one day amazed me, but like many Italians, he is a gracious person who saw an opportunity and was more than happy to spend some time with me. Thank you Mariano for your hospitality and for your beautiful wines. A big thank you also to my friend in Chicago, Aldo Zaninotto, who represents these wines in America. To learn more about the wines, the agriturismo or the osterie, go to the Buglioni website. If you want to be the best at something, you have to work at it every day; everyone's heard that before, but it remains as true today as it was hundreds of years ago. Tom Verhey is no doubt a subscriber to this theory and it's been 30 years of dedication that has made his establishment, Pops for Champagne, arguably the finest Champagne bar in America. I sat down recently to conduct an interview with Verhey; I wanted to pick his brain about why Pops for Champagne has been so successful for so long. I wanted to know about the types of customers that he attracts (skewed towards professionals, females, consumers in their 30s and 40s) and how he continues to draw them in during these economically challenging times. Again, it's a lot of old-fashioned work on his part and that of his staff. Verhey, who in a former life sold camera equipment, was in Vienna, Austria in 1980 and entered a Champagne bar called Reiss. Intrigued by the outer appearance of the building and the concept in general, he decided then and there to open a Champagne bar back in the Chicago area, where he lived at the time. 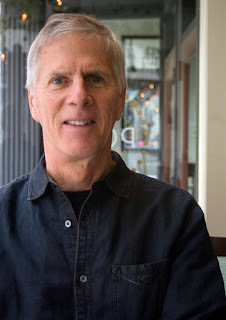 He opened his inital bar at a northside location in Chicago in March, 1982 and moved to his current location in the River North section of downtown Chicago at State and Ohio in the fall of 2006. While he was successful at his initial location, Verhey said that was too much of a "destination", while the current spot is perfect for attracting a bigger crowd, be they theater goers, conventioneers or just business people leaving their offices for the day. While his business has taken a "hiccup" as he puts it, given the recent economy, he has been able to keep customers coming in, thanks in no small part to his pricing. "We are able to compete against the dwindling dollars because we actually give value to our customers. People still feel that this is a place they want to spend their money, because when they walk out having spent $50 or $400, they got their money's worth." What keeps the customers coming back of course, is the outstanding selection of Champagnes and other sparking wines (the lists can be seen here). The task of assembling such an impressive grouping of wines is the responsibility of Beverage Director Craig Cooper, whom Verhey calls "probably the most Champagne-savvy person in America." Cooper and Verhey definitely prefer the smaller Champagne houses, so while you can order a selection from Mumm, Perrier-Jouet or Veuve Clicquot here, you're much more likely to select from outstanding firms such as Gosset, Ruinart, Bollinger or Krug or from an amazing array of small grower-producers such as Cédric Bouchard, Pierre Moncuit or Agrapart & Fils, to name only a few. 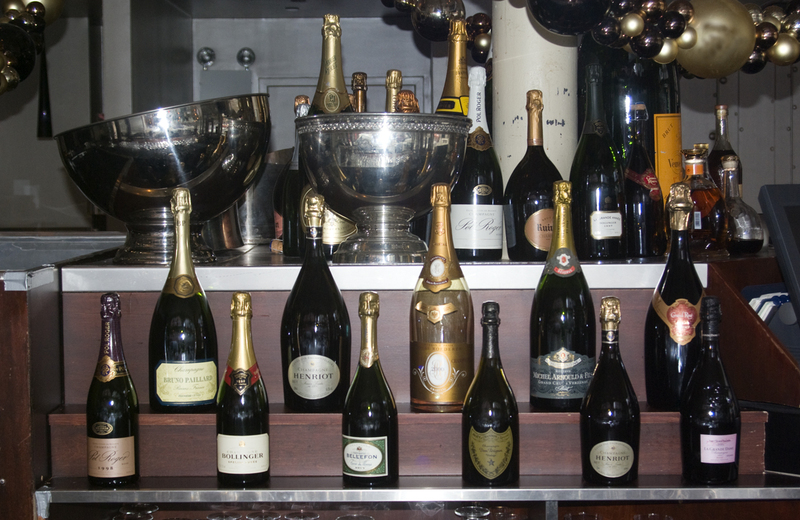 The list is handsomely presented and organized into numerous categories, encompassing classics such as Blanc de Blancs and Rosé, but also sub-divided into three styles of non-vintage Brut, a nice touch and one that is extremely helpful to customers looking for a particular style of Champagne. There are also a few dozen sparkling wines from around the world that are not Champagne; these include Prosecco and Franciacorta from Italy, Cava from Spain as well as some lovely examples from California and Oregon and even some from other wine regions in France, such as Alsace, Burgundy and the Loire Valley. Verhey knows the importance of offering sparkling wines other than Champagne on his list; "You have to have sparklers; sparklers start at $30 a bottle, while Champagne starts at $90 a bottle, so you need that bridge. "You've got to have a bridge with this type of business to carry them (the customers, ed.) from the start of their education and taste and experience into Champagne." Staff training, conducted by Cooper, has given the employees here a strong foundation in their everyday work routine. "You come in here and ask a question about anything with food and beverage and the staff is going to know the answer," Verhey notes. "That the staff is so well educated reflects the fact that they care enough about the business. It takes time, but it eventually makes the difference." After 30 years, Verhey is proud of what he's done so far and what he is currently accomplishing at Pops for Champagne. "We're trying to bring people's image of Champagne to a more approachable level, so it doesn't have to be a coat and tie, special occasion type of thing," he remarks. As for advice to consumers as to why they should drink Champagne more often, here are a few final thoughts from Verhey. "Champagne is all about life and energy and quality and it brings those elements to the glass. People are starting to understand that it's part of their life also. "There are so many different styles of Champagne, from the ultra-dry to the sweeter to the Chardonnay-infused to the Pinot Noir-infused. It's an everyday wine now."